‘You’re going back. Ukraine not allowed –’ and he pointed to the bike, he being the Polish border guard, dressed top to toe in sludgy green uniform. He was right – I was going back. Ukraine didn’t allow foot passengers at this border point, so rather than take a lift across to the other side, I opted for the cycle south to Medyka. The guards laughed at me when I told them and they shouted this out to the queues – and they all laughed too. I can’t say I felt like laughing at that point – I was pretty gutted by it after a long day’s pedalling. I cycled off swallowing back the tears and cursing myself for the mistake. An hour later, however, I was calm, smiling and glad that it had happened. I had cycled down some pretty little country lanes, accompanied by a sweet dusk chorus and a beautiful fiery sunset. As I went through one village, Kalnikov, I came alongside a lady on a bike also heading the same way. I took off my glasses and smiled a ‘hello’ as I went past, but then stopped as she exclaimed at me. She was beaming a huge smile and chattering away in Polish – asking me what I was up to and where I was going, I imagine. I mimed and chatted back with what I thought were appropriate answers and we laughed at our lack of a common language. She called over some children to translate for us, but the two oldest only had snippets of English so we didn’t get much further. Various people – older sisters, a mother – and a dictionary were brought out of houses to help the process, but the crux of it was clear. Panni, the smiling lady on the bike, wanted me to stay at her house that night and would not hear of me cycling on and camping out in the cold. One of the children read out of the dictionary ‘It looks like rain’ and pointed to some clouds in the distance before giggling nervously. She was right, it did look like rain, and I decided that it wouldn’t look like Ukraine tonight. Staying with Panni was like having another Mum for the night – this wonderful woman ran me a bath, fed me with bread and ham and hot tea until I could eat no more; her husband called up their son to speak to me in English and find out what it was all about, and then I showed them pictures of my family and the journey so far on my laptop. 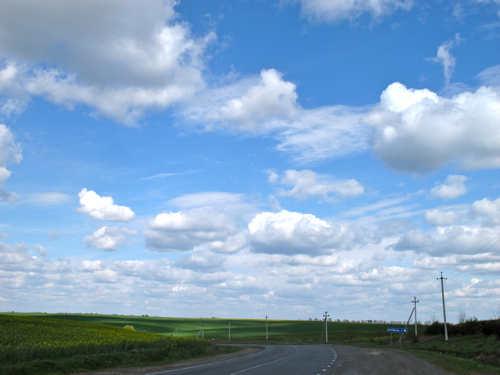 I have been in Ukraine a week now, having cycled half way across the middle belt of it. It is a very different country to those I have left behind and I am certainly more of an anomaly here than I have been so far. The language is challenging as it consists of a whole new alphabet as well, but with my ‘magic letter’ explaining what I am doing, suspicious or confused looks turn into smiles and nods. It has led to some wonderful moments of kindness and hospitality, too – like that with Roman the signalman, who let me warm up and cook dinner in his signal box (he wanted me to sleep in there too but I firmly stuck to my tent outside.) 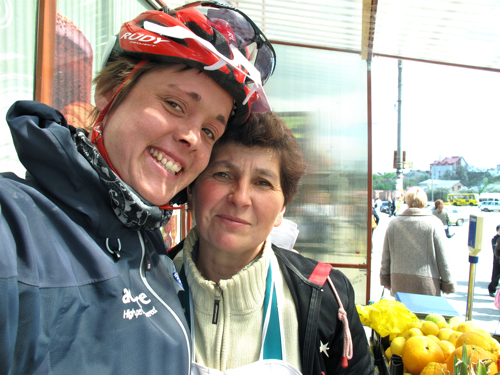 There was the old man who bought me some biscuits and the shop keeper who gave me some free sweets, and then there was Helen, the fruit-seller in Ternopil. She made me tea and noodles, and fed me biscuits all afternoon at her stall, as we chatted away with pictures and gestures on both sides to tell our respective stories. Yesterday was the commemoration of the end of World War II here in Ukraine – and after a whole memorial service turned to smile and wave at me as I pedalled past it in a village, I decided to look into this country’s story. Ukraine suffered greatly during that era – being occupied by both Hitler’s and Stalin’s armies. No one hears that side of the story though – in a couple of articles I read, it was suggested that in both material damage and human losses, Ukraine suffered the worst lot of any country. After a week here, I have decided that it is a country of contrasts. I have been chased by snarling dogs and welcomed warmly by local people; I have been scammed and I have been looked after; I have had friendly mutli-toots from drivers and have been forced off the road by drivers; I have baked in the sun and have frozen in the cold wind. 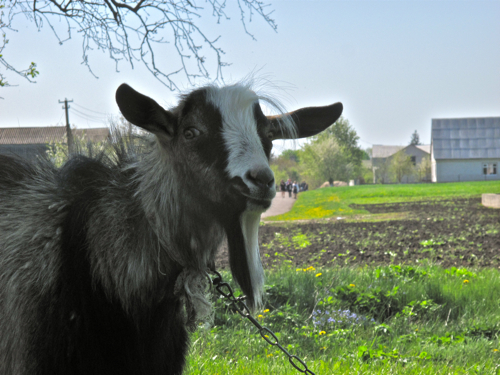 Life in rural villages is tough and for the most part manual. Horse and carts are a more common sight than tractors and whole families will work together in the fields to sow seeds and prepare the land. Old women will walk for a few miles to sell eggs at the roadside, wrapped up as warmly as they can against the harsh wind which whips across the landscape. Most houses are not plumbed – each garden has a well with a bucket, and rather than roads being full of pot holes, it seems that pot holes are half full with roads in places. Shops remind me of pictures of 1940’s shops in Britain – the shop keeper stands behind the counter and fetches you whatever it is you want. Many things are sold by weight and one lady the other day even counted out my bill on an abacus. I haven't seen a single sheep in Ukraine. A few cows but mostly goats. Yet the other side of this, are the Mercedes and Audis that whistle past the beat up old Ladas and horses – or the mobile phone masts which peek out in every vista, or the kiosks selling sim cards in village streets. Even the pot holed roads have their smooth and brilliant counterparts, but who knows who decides which stretch gets repaired and which doesn’t. Contrasting completely with the labour intensive subsistence farming in villages is the big bucks mechanised stuff which has turned whole horizons brown and then green with cropping. Cycling through these uber-fields has been bleak at times – the wind blasting down from the North East and cars hurtling out of nowhere with varying degrees of regard and tooting for the fully laden cyclist pedalling hard into the head wind. So, Ukraine for me has been a challenge, but a rewarding and eye-opening one at that. There’s another few hdays until Russia, so I’d better sign off and get back to the pedals. 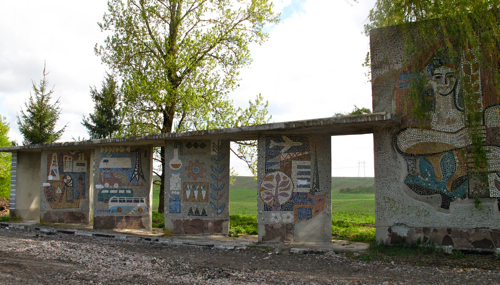 PS I vote Ukraine has the prettiest bus stops in the world. What do you think? Sarah, I am so glad that you are meeting the likes of Panni and Helen on the road – it’s heartwarming to read that there are such kind and generous souls around. Loving all your blogs – hungry for the next one!! Glad to see the world is taking care of you Sarah. You’re crossing eurasia at a decent clip. Marvelously written blog. It makes me wish I was there with you to witness some real human kindness, reminding me of some of the more rural parts of Britain many years ago. Do be careful though. We are all very impressed by your bravery. Happy pedaling Sarah ! Hey Sarah, how are your knees holding out? If I was to cycle a significant milage every day mine would be in tatters by now. Hopefully your injury free, lovin the blogs. Stay safe..
Wow – just amazing. You are just sooooooo brave and a brilliant diarist. I can’t wait to read the next bit and what a book this will make. Great Blog! It all sounds marvellous, but don’t take any ess aitch one tea from those scammy types! Do keep safe. What next can we expect from you, so many things have happenned and you take them all in your stride. It’s good to hear how people have been so welcoming to youand I am sure they will continue. What a wonderful way you write up your travels, we are there with you throughout them. Sarah, I’m glad to meet you. Ignorance of English did not give me the opportunity to obschatsya with you. 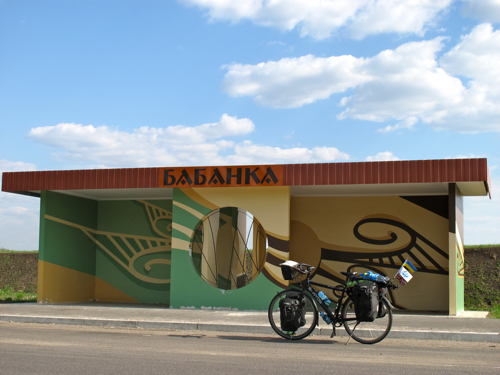 In Kirovograd many cycling clubs would like to accompany you on a journey. They are too late to hear about your stay here. We have little information about your route to Ukraine. Hi Oleg, great to hear that you managed to meet up with Sarah. I’m sure your English was better than her Ukrainian! I’m sorry you didn’t have much information about her route. Unfortunately, Sarah hasn’t planned out a detailed route in advance so it’s hard to know exactly where she’ll go. Still, I’m glad you at least managed to catch her briefly. Loving the blogs. Keep it up, and thanks for inspiring me, you’ve sowed the seed for my gap year ! We love the bus stop! We think the goat should shave his beard. Meeting with Sarah persuaded me to study English. I wish you good luck to Sarah on the road. I understand a lot of difficulties in your way and I’m convinced that we must overcome. Oleg, if it’s not too late, Sarah says she’s been following the M04 E50 to Lughansk and onwards today. Agreed on the bus stop comment, but I think the goat picture especially stole my heart. CUTE!